• Authors: Jason H. Grunhut et al. What are the origin and evolution physics of magnetic fields in massive stars? The origin of magnetic fields in massive stars are poorly understood, since the envelope of such stars are radiative rather than convective, excluding the possibility of a solar type dynamo effect. The favored hypothesis for the presence of magnetic fields in massive stars are that they are fossil fields, that were either accumulated or generated during star formation. Another possibility is that these fields are the result of some other type of dynamo mechanism. How do magnetic fields affect the rotation and rotational evolution of massive stars? Massive stars have strong radiatively driven main sequence winds. In the presence of a magnetic field, these winds carry angular momentum away from the star, spinning the star down as it evolves. This is because the magnetic pressure forces the wind to co-rotate with the star to a location outside of the stellar surface, known as the Alfven radius, where the magnetic pressure is balanced by the ram pressure, ρv², of the stellar wind. Here ρ is the density of the wind and v is its velocity. This location effectively acts as a lever arm, conveying spin down torques on the star. How do magnetic fields effect the evolution of massive stars? Magnetic fields inside the star influence internal differential rotation, mixing, and transport of angular momentum. These fields cause the star to undergo uniform rotation which yields slower rotating cores and faster surface rotation. They can increase mixing leading to an enhancement in surface metallicities, thus increasing mass-loss rates. What are the origins of the magnetic fields of neutron stars and magnetars? Neutron stars, the corpses of many massive stars, have magnetic field strengths on the order of 1011 – 1015 Gauss, with magnetars at the high end. The origins of these fields are unknown. Could they be fossil fields or are they generated during the violent processes accompanying their death? Prior to this survey, magnetic fields have been detected in only a small handful of young and evolved OB stars. These fields are between a few hundred Gauss to several kiloGauss and typically have a bipolar topology. Magnetic fields are detected in stars by measuring the Zeeman effect, the magnetic splitting of photospheric spectral lines, in stellar atmospheres. In the presence of a magnetic field, the spectral line splits into closely spaced components with energies shifted from the rest energy. The change in energy is proportional to the strength of the magnetic field. However, measuring this signature in massive stars have proven to be difficult due to the broad and relatively few optical spectral lines. This intrinsic line broadening, due to thermal, rotational, and/or turbulent effects, makes detecting Zeeman line splitting extremely hard with unpolarized light. Luckily this signature can be detected in circularly polarized light. The MiMeS team uses the bench-mounted, high throughput, fibre-fed high-resolution (R ~ 65000) ESPaDOnS spectropolarimeter and it’s twin Narvel at the 3.6 meter Canada-France-Hawaii telescope to perform Zeeman-Doppler imaging of the stars in their survey. With such high resolution they are able to resolve individual helium and metallic signatures in the observed spectra. Most of the magnetic fields that have been detected in massive stars tend to be relatively weak so the MiMeS team require large signal-to-noise ratios (S/N) on the order of ~10,000 to detect a Zeeman signature. To get a large enough S/N they employ the least squares deconvolution (LSD) multi-line technique, a technique similar to cross-correlation, which can enhance the sensitivity of Zeeman-Doppler imaging, to produce a single mean profile from the unpolarized light, circularly polarized light, and also from the diagnostic (null) spectrum. Example LSD profiles are shown in the figure below for several massive stars observed. Mean least squares deconvolution circularly polarized light profile (top curve, red), diagnostic null (middle curve, blue), and unpolarized light profile (bottom curve, black) for a sample of stars from the MiMeS survey. Also included are the spectral type and computed line-of-sight component of the magnetic field for each LSD profile. A magnetic field is detected if there is excess polarization signature within the circularly polarized line profile. In the figure above the Zeeman signature is present in HD 61556, HD 142184, HD 57682, and HD 108. As of July 11, 2011 the MiMeS survey have looked at 166 stars, 14 of which have detectable magnetic fields. They found that approximately 8% of all hot, massive stars host strong, large-scale magnetic fields. The incidence rate of magnetic fields is ~10% for B-stars and ~6% for O stars as shown in the figure below. This result agrees with the 5-10% incidence rate that is found for intermediate mass stars suggesting that the origin of these fields may result from a similar mechanism (e.g., that they could be fossil fields or generated by a type of dynamo process). Incidence fraction of magnetic stars relative to the total indicated sample of all stars observed as part of the MiMeS survey and related programs. 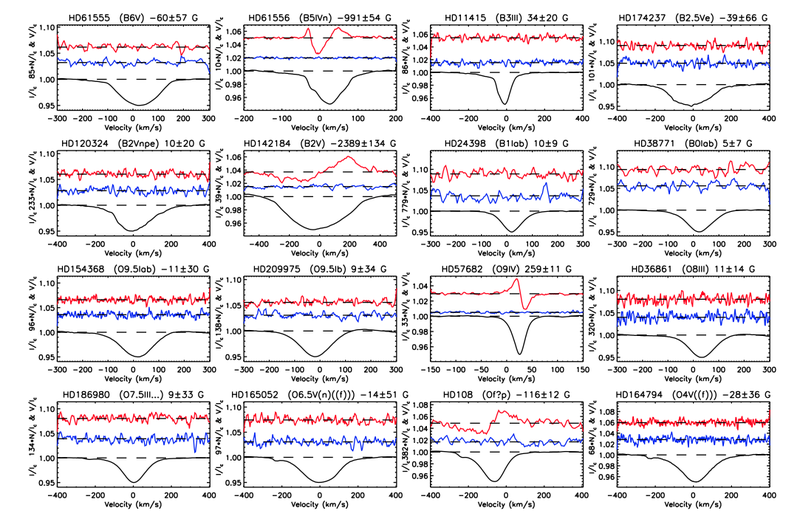 They find that ~8% of all O- and B- stars host detectable magnetic fields. For an overview of the MiMeS project click here! For a review on magnetic fields in both low-mass and massive stars click here!